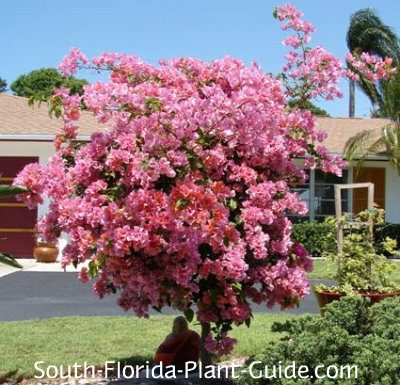 Nothing is more breathtaking than a bougainvillea tree in full bloom, lighting up a South Florida home landscape with its spectacular color and beautiful tree shape. Buy a bougainvillea already trained to tree-form. The hard work is done...all you have to do now is keep the plant trimmed to maintain the tree-like shape. This involves regularly snipping stray shoots off the "trunk" and shaping the top, usually after a bloom cycle. Yes it's thorny. And you will have to trim it often to keep the tree thing going (wear heavy garden gloves for protection). But a bougainvillea "standard" (meaning a shrub trained to grow as a tree) is often easier to maintain than the vine or shrub form. You can get in closer to the plant because you're trimming it often and the base is not full of branches that can reach out and grab you. 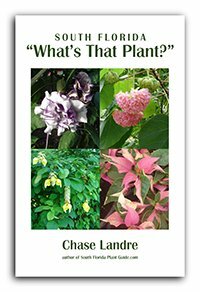 The plant blooms off and on all year round, especially nice in winter when less plants will blossom. The flowers are actually the tiny white blooms in the center - the flower bracts are the colorful part. 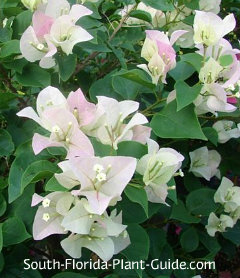 Bougainvillea comes in many vivid flower colors - red, pink, purple, white, orange, gold and shades in between. Q: Beautiful bougainvillea - is it a vine, shrub or tree? A: Yes. All of the above (except for certain varieties). 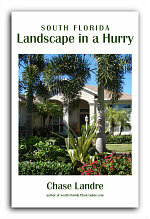 It just depends on how you grow it in your landscape. "Bougies" are fast growers that need full sun - all day if possible - to bloom heavily and often. They're moderately salt-tolerant, and cold-tolerant throughout Zone 9B and southward. 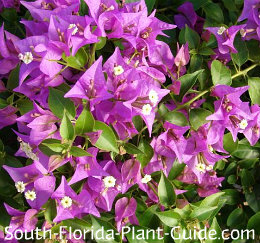 Bougainvillea is a drought-tolerant plant, preferring regular waterings but let them go dry in between. It must have well-drained soil or it won't survive. You can keep a bougainvillea tree 4 to 6 feet tall (or taller, though it will be harder to reach for trimming). Stake it to keep the plant growing as straight as possible...the heavy top may be inclined to lean. Staking also helps prevent breakage during strong winds. Although this is a cold-hardy plant, yours may experience some leaf drop if winters are very cold or windy. It will flush out again once the weather calms down. Add top soil or organic peat humus to the hole when you plant - or a combination of one of those with composted cow manure is even better. To keep your bougainvillea tree blossoming as much as possible, cut it back fairly hard after each bloom cycle. Then fertilize with a bloom-boosting fertilizer to get new growth and another set of flowers as soon as possible. Fertilize at least once each a season during spring, summer and fall with a top-quality granular fertilizer high in phosphorus (or supplement with bone meal) to promote the most flowers. The canopy of this small tree naturally grows somewhat lopsided...don't go crazy on trimming for very manicured look or you'll be cutting off new growth and potential blossoms. Because you control the size of your bougainvillea standard, it can be planted as close as 3 feet from the house or most anything else. Just be careful of getting it too close to foot traffic areas where someone might have to brush by it and get snagged by thorny branches. If you plant it in the center of a garden bed, remember you'll need to get in there to trim fairly often so leave yourself some room around the tree. The flower bracts can make a mess as they drop on walks, drives and patios, so locate the tree where fallen blooms can land on the yard or garden bed. A bougainvillea tree is fine in a large container placed in a sunny area away from strong winds. Because it grows fast, though, it will outgrow the pot and eventually need to be root pruned or planted in the ground. 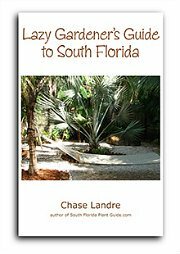 COMPANION PLANT SUGGESTIONS: Interplant with low-growing sun lovers that also like to go dry between waterings - things such as carissa, Indian hawthorne, juniper, dwarf clusia, coontie, and lantana.